Onyx is a banded variety of the oxide mineral chalcedony. Agate and onyx are both varieties of layered chalcedony that differ only in the form of the bands.The specimens of onyx contain bands of black and/or white. It is found all over the world. 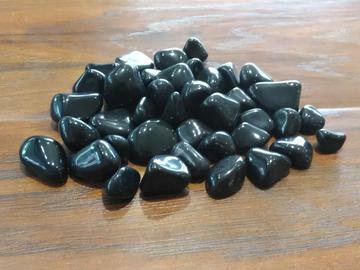 Onyx helps the development of emotional and physical strength and stamina. When support is needed during times of stress, confusion or grief. Onyx fosters wise decision-making. Stone sizes range from Small 1/4" -1/2" Large 1/2" - 3/4"